While sit to stand workstations have proven to minimize the risk of injury, improve health and wellness, and increase comfort and productivity for most, they aren’t good for everyone! In fact, they remain quite controversial in the literature as to their true health benefits. The bottom line… people want to stand to be productive at their computer if they can and when they want to! Here’s a quick guide to help you decide when it’s appropriate to provide a sit to stand workstation for computer, phone, or desk work, how to ensure you get the right fit for your employees, and how to minimize your need to invest by creating alternative opportunities to stand at work. Every employee is unique and has different needs when it comes to a sit to stand workstation. Before investing in sit to stand solutions, a thorough ergonomic evaluation is recommended. Here are three popular styles to consider and when to use them. Each has its pros and cons to be aware of. The front clamp mount solution is ideal for employees who currently use a keyboard tray for below desk keyboard/mouse access (usually 5’3” or less). This solution can be used for single and dual monitor use. A small surface can be added for additional workspace between the monitor and keyboard for writing, document or phone support. The unit raises and lowers together on an internal pulley system rather easily and mounts to the front of the desk making it a more portable solution. 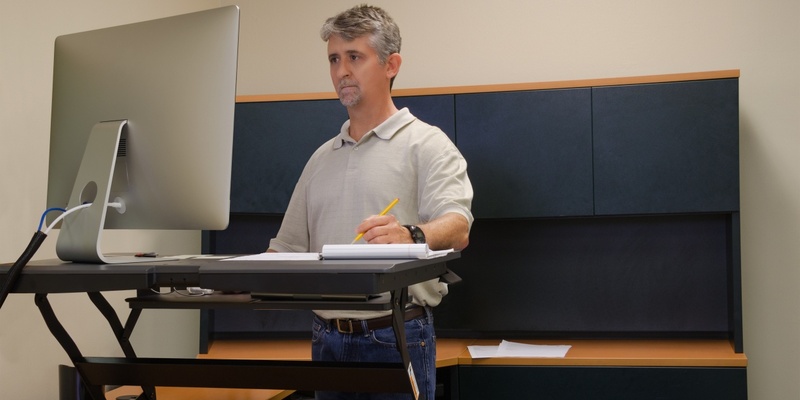 While it is sit to stand height adjustable, the monitor distance is fixed which may negatively impact employees with near or far vision issues and the keyboard tray can’t retract but rather folds upwards. Assembly required. 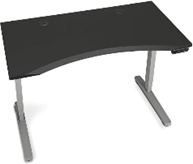 The desk on desk solution is very popular as it is easy to set up typically right out of the box and very affordable. The unit rises either straight up and down or in an arc by clasping side handles. The user must physically lift the unit assisted by spring loaded hinges or pneumatic support. However, add one or two monitors or laptop and it can easily be loaded with up to 45 lbs. Users must also have the arm span and grip strength to clasp the levers on each side to raise them as well as the desire to manually raise and lower the whole system. For someone with a back problem, engaging this could be quite challenging. Typically, there are multiple height settings to 14”H above the desk but may only go as low as 4” above the desk for the monitors. The keyboard platform adds 1” of keyboard elevation on the desktop. This is not a solution for a petite individual or someone who wears bifocals as it elevates the keyboard and monitors above typical desk height! The desk on desk solution takes up a lot of space on the desk top often requiring a second desk for non-computer related tasks. So, if employees multi-task, this may not be suitable because it creates two different desk heights for reading/writing vs. computer use. Often there is just not enough space to do it all on the desk on desk solution. This type is also available as electric lift and can be moved rather easily, if needed. The electric sit to stand desk is the most practical, best fitting and most economical long-term investment for employers and employees. There is no forceful exertion or need to grip or bend forward awkwardly to raise and lower this table. The price has become very competitive compared to the other solutions as well. In many cases, just the electric base can be purchased if you already have surfaces in good condition you can use. The recommended range of adjustability is from 22”-47” to accommodate 99% of users. Anything less and you will need to add on keyboard trays to benefit some employees. 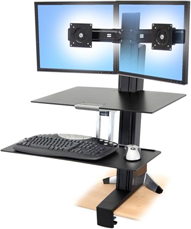 Add on a single or dual monitor arm and this investment will last over 15 years with minimal to no maintenance while providing a universal fit for just about everyone. If your employee presents with a medical certification indicating the need to stand at a computer due to an appropriate medical condition or functional limitation with prolonged sitting, that’s a trigger for an (ADAAA) interactive process and a reasonable accommodation, which may include providing a sit to stand workstation. In this case, you should explore which device will allow the employee to achieve standing with the most ease. Understanding their functional abilities, limitations and essential tasks will help guide you to the best solution including modifying how the essential functions are performed in the interim. Ultimately, the employer has the final say in what accommodation or sit to stand solution they are willing to provide. Just be sure it will fit your employee assuring their ongoing productivity and safety. 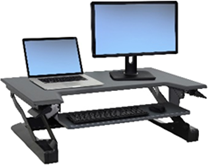 The best solution, when it is feasible in the work area, is an electric sit to stand desk (22”-47”H range) and a monitor arm for appropriate placement of monitors in sitting and standing. Healthy employees or mildly symptomatic employees often want the opportunity to work at their computers in standing because they are tired of sitting all day or find their chair to be uncomfortable and a poor fit. For an employee with no diagnosed medical condition but is mildly symptomatic and spends more than 4 hours a day at the computer with limited alternative tasks, providing the manual solutions may be most appropriate; either desk on desk or front desk mount will likely meet their needs. If the employee is healthy and/or works out of the office or telecommutes a portion of their work week spending less than 4 hours cumulative time at the computer, an ideal solution might be to raise the cubicle surface to a fixed height standing desk and keep the other surface at seated height (must have 2 panel mounted adjustable surfaces for this). For those employers who are not providing sit to stand workstations for all employees, an ergonomic assessment is recommended so that management may choose the most appropriate strategy on a case-by-case basis. If you plan to shop for a solution, make sure you measure the employee for best fit in sitting and standing and compare it to the range the product offers while matching the other features to your employee’s needs. If your employee is petite and currently uses a keyboard tray, don’t provide a desk on desk solution! It won’t work! So, choose wisely. Oh, and the standing mats! Another controversy… research is skeptical on the need for these devices. Especially with the latest guidelines suggesting standing should be performed on a limited basis for no more than 15-30 minutes at a time with the goal of 2.5-4 hours cumulative standing time through the day. Regardless, each person will have their own unique tolerance for standing. But wearing comfy shoes is a must! In other words, no high heels, ladies! The bottom line, we can all stand to stand more, provided we can and want to! Any way you look at it, the desire to stand at work is here to stay. Developing a policy and plan will help you be prepared when employees ask. For more information about policy development check out our sit to stand guidelines and medical certification form or give us a call for a free consultation on setting up your sit to stand policy.